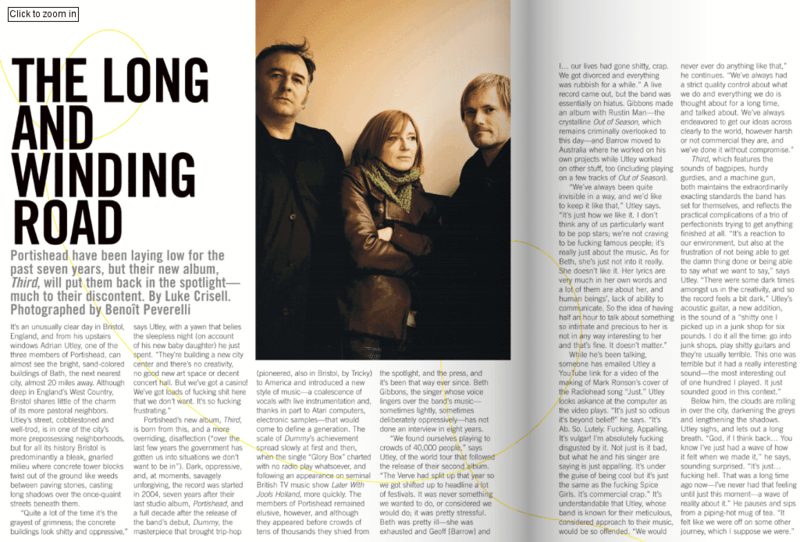 Or at least, whoever wrote this article for NYLON about Portishead did. It uses such insulting language, I was quite offended by it! I’m not sure whether the article was written by someone who had come over here from New York, or was written based on what the band member was saying, but either way, it is quite strange. Click on the picture above to read the whole article. These introduction paragraphs were the ones that got to me the most. It’s an unusually clear day in Bristol, England, and from his upstairs windows Adrian Utley, one of the three members of Portishead, can almost see the bright, sand-colored buildings of Bath, the next nearest city, almost 20 miles away. Although deep in England’s West Country, Bristol shares little of the charm of its more pastorial neighbors. Utley’s street, cobblestoned and well-trod, is in one of the city’s more prepossessing neighborhoods, but for all its history Bristol is a predominately a bleak, gnarled milieu where concrete tower blocks twist out of the ground like weeds between paving stones, casting long shadows over the once-quaint streets beneath them. The phrase “prepossessing neighbourhoods” was one that particularly entertained us. I had to look up what prepossessing meant, as it is not something I had come across before. It apparently means “serving to impress favourably”. I immediately assumed he lived in Clifton. Heh. I adore Bristol, so I am obviously going to disagree with the comments made, but to say that the city is bleak, with no creativity is crazy. This is one of the major cities in the country, and there is something going on all the time. I subscribe to Venue which shows whats on each week, and always has something I want to go to. Bristol is such a varied city, from Clifton to St Pauls, Bedminster to Frampton Cotterell, each area has something different about it but it all works nicely together. Perhaps Adrian Utley hasn’t been out in Bristol for a long long time? I suggest he gets out a bit more and sees what this gert lush city has available to everyone. You should send that in to Nylon! The ‘omg nylon i love you’ letters page annoys me so much. @Jen – Actually, I was thinking of sending it in. I do love Nylon, but the article irritated me so much!